What's exciting about this year's high　school baseball tournament? The high school baseball invitational tournament will kick off on March 21. The Mainichi Shimbun answers some common questions readers may have about some of the main attractions of this year's event. Question: What are some attractions particular to this year's spring tournament? Answer: This year marks the 100th anniversary of the high school baseball tournament since it was first held in the summer of 1915. As fitting for such a commemorative occasion, 22 out of 32 high schools participating in the event are making a comeback after lengthy absences. In particular, Ehime Prefectural Matsuyama Higashi High School will compete in the event for the first time in 82 years, a record in the history of the spring tournament. Wakayama Prefectural Toin High School is also participating for the first time in 53 years. Both schools have been chosen in the "21st century bloc," where three high schools are invited to play based on their qualification results. Q: What is significant about those schools? 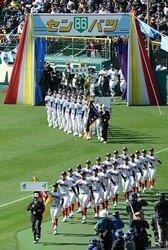 A: Both Ehime and Wakayama schools' baseball clubs were established in the 1890s. Novelist Soseki Natsume taught at the precursor of Matsuyama Higashi High and authored the popular novel "Bocchan" -- based on the author's experience as a teacher at the school. Poet Shiki Masaoka, who is believed to have been involved in establishing the baseball club at the Ehime school, has been admitted to the Japanese baseball hall of fame for his achievements in promoting the ball game in Japan. Toin High School participated in the spring invitational tournament 11 times in a row since the first game in 1924. It's one of 15 high schools across Japan that has competed in preliminary regional games every year since the beginning of summer tournaments. Q: Those schools are both located in the western part of Japan. What about schools on the east side? A: High schools from the Tohoku region are getting much attention from baseball fans as there has never been a national champion from the area in either the spring or summer tournaments. Sendai Ikuei Gakuen High School in Miyagi Prefecture, Hanamaki Higashi High School in Iwate Prefecture and the predecessor of Hachinohe Gakuin Kosei High School in Aomori Prefecture all made it to the finals of the spring tournament in 2001, 2009 and 2012, respectively. Sendai Ikuei Gakuen is the favorite to win this year's spring tournament after its victory in the Meiji Jingu fall tournament last year, in which winners of each regional tournament play. Q: Are there any plans during the tournament for special events to help bring back baseball along with softball to the 2020 Tokyo Olympic Games?